What may be a noxious weed to one gardener is a thing of beauty to another. This might not be the case with willowherb weeds. It is true the plant has brilliant hot pink flowers similar to primrose blooms, but the ability to adapt to almost any environment and rapidly spread through seeds and rhizomes make control of willowherb challenging. This annoying plant is an aggressive competitor to native and cultivated plants. Read on for some clues on how to get rid of willowherb once and for all. Willowherb (Epilobium) is a Class B noxious weed in many states. In its native regions, it is simply part of the natural flora and a beneficial part of the landscape. But when soils are disturbed, the seeds spread far beyond their home turf and can cause quite a problem for farmers, land management professionals and home gardeners. There are many varieties of willowherb weeds. Hairy, Canadian, Tall, Greater, you name it; there is a species of the weed. Most site themselves near water of some sort, but they are also adaptable to dry, disturbed areas. Most of the West Coast of the United States classes them as problem plants due to their aggressive spread. They are tall plants, 3 to 6 feet in height, with narrow profiles and thick, rigid stems that are herbaceous rather than woody. Flowers appear in late spring through late summer, adorning the plant with richly colored pink blooms. Full willowherb information would not be complete without mentioning the fruits. Seeds are small hard four-chambered capsules, brown as a nut and containing numerous tiny seeds. The capsule splits open and releases these tiny egg-shaped seeds, each equipped with a hairy tuft at the end which captures the wind and sails far and wide. The problem is that willowherbs are remarkably resistant to most herbicides. 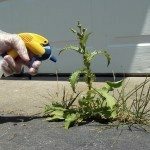 It can take years of persistence before the plants are eradicated in a garden bed. Cut off any flowers before they produce seed heads. Seedlings can be killed with black plastic covers creating a sterilization effect through solarization. Mature plants are dug out deeply and thrown away. Don’t try to compost these plants, as they will simply take over your compost heap. Chemicals should be a method of last resort, as they tend to do as much harm as good. Indeed, with this weed, control with herbicides is erratic and may take several seasonal applications even with good cultural methods. Glyphosate is not effective on its own, so put down the Round Up. The most effective treatments have been shown to be a broad spectrum combined with a pre-emergent application. The pre-emergent keeps seeds from germinating and reduces seedlings. Glyphosate can eventually navigate the vascular system of mature plants and kill them. It is important to keep up on deadheading during this period of treatment in order to reduce seed spread to untreated areas. Both treatments will need to be done for at least 2 years for the most effective control.